“Told from a child's perspective, Azzi in Between is a sensitively told story about Azzi and her family who are forced to flee their country to survive. Their country is not named and nor is her family's destination mentioned. This opens the book up to readers that may have experienced forced immigration and can enable them to identify with the family thus helping them to share their stories. 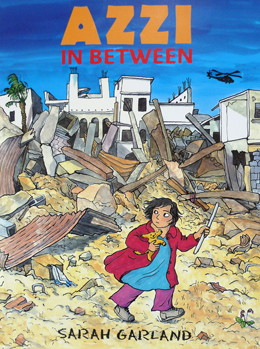 The book has so much potential to be used in educating children and adults ignorant of the privations that refugee families and children experience when fleeing unstable regimes. “...a small miracle of compassionate storytelling... Azzi in Between should find its way into every primary class.” Amanda Craig, The Times. “...This is a moving story not only of survival against the odds, but of the humbling resilience and transcendence of the human spirit. Every school should have several copies.” Picture Book Special for June/July. Jill Bennett's Red Reading Hub. “...With striking illustrations and beautiful ending, this is an inspiring book for readers eight-plus.” Mary Arrigan, Irish Examiner. 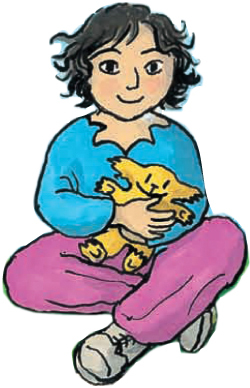 “This is a perfectly wonderful story, and a very necessary one … Opting to make her story a 'comic' means that Sarah gets the message across of what was, what happened then, and the final result, in a way you wouldn't with a traditional novel...” Ann Giles, Bookwitch. For many years, while I had been writing and illustrating picture books set in the familiar territory of home and school, images of displaced children kept returning to my mind. They were the result of stories – often horrific stories – that had been told to my sister-in-law by refugee children, when she had worked with them as a teacher's aid in Oxford schools. She had shown me their accounts, and I had looked at their childish pictures of guns and helicopters and dead people. They struck my heart. But how could I help? What could I do? I lived in the country, had four young children and worked full time. Then, in the autumn of 2010, our children grown, I travelled to New Zealand with my husband, to spend four months in a small city there. He was to work in a pottery, and I had decided to work on an adult book about a family of early New Zealand settlers, for which I had done some research. We rented a 'unit', and, on our first day, I walked down the hill to a charity shop, to buy a blanket and lampshade, to make our room homely. It was there that I encountered my first refugee family. They were Burmese, the parents looking through hangars of clothes, the children standing quietly by. They looked anxious, serious and grave. I walked on, to the library, to collect my reference books, and passed more Burmese families. The children kept close to their parents and they all kept their eyes fixed to the pavement, a contrast to the cheery shoppers and holidaymakers in the streets. At the library – large, thriving and packed with books – I veered off course to the children's section and found a librarian. The librarian paced among the shelves, looking thoughtfully at the titles. I walked home. My original project was forgotten. I was filled with a sense of purpose and could think of nothing now but my new idea. For the rest of our four months in the city I worked on the book. I began by reading memoirs of those who had been forced to flee their homes as children – haunting stories of suffering and endurance. However diverse their nationalities and situations, the stories had common themes – the sudden removal from home, the loss of possessions, the loss of family and friends, the often frightening journey, the privations. Then the arrival, the adjustment to an alien culture and language. Sometimes there was an almost crippling sense of loss of status and of feelings of selfworth, particularly among the men of the family. I found that these same themes were repeated again in government research papers and reports. Grandma's blanket in my book sprang from. My focus became the local school, and the teacher of refugee children there. This was an inspirational place, and she was an inspirational woman. I sat with the new arrivals, with their guarded expressions, their body language showing their bewilderment and anxiety. They had a Burmese helper and translator, who, like them, had spent many years in camps in Thailand, waiting for a chance to leave and make a new life. All of them had had to escape through the jungle and cross the border secretly to reach the camps. I saw how those children changed as they discovered new confidence, how their eyes brightened, how they began to join in the games and lessons. They painted (helicopter gunships were a favourite subject), and sang, and at the end of term they took part in a gigantic musical which involved everyone in the school and was wonderful. The pride of the parents was also wonderful to see. worked with my husband – the first time I had worked with him on a project. The story of Azzi was very much a joint effort. images, and I discovered artist's felt tip pens, concentrated water colours and inks, a big change from my usual method of working. The format also gave me the freedom to speed up and slow down the action visually, For example I could encompass the long journeys of Grandma and Sabeen in one page each of strip cartoons, without interfering with the flow of the book. In England I was immediately given support by my publishers. I kept re-writing, and was given advice from specialists in immigration law and human rights, from teachers, and from the sister-inlaw who had put the images of those refugee children into my head so many years ago. I also rewrote to make sure the story held to a path that did not include actual horrors, but was nevertheless true. As for the character of Azzi herself, she developed from a little Jewish girl in a memoir I had read, from a child in that New Zealand school, and a photograph in a newspaper of a Kurdish refugee, which I pinned above my drawing board. But, in the end, she took on a life of her own, a life that she handled with courage, humour, and fortitude.